Browse » Home » Phone Electronics Computer » Apple iMac, MacBook, Mac Pro, iPads, iPods and iPhones EX-DEMO Clearance! 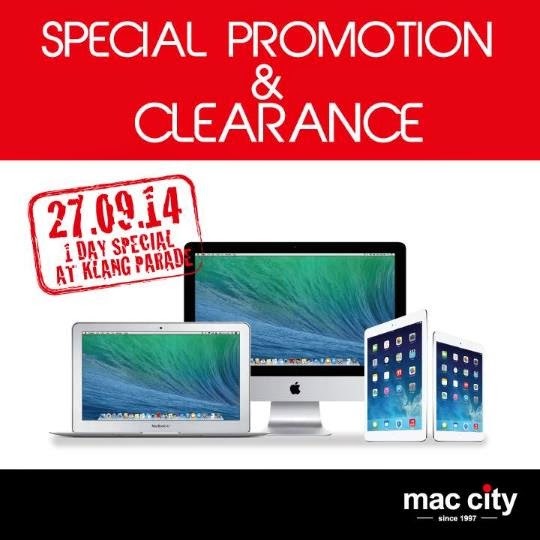 Apple iMac, MacBook, Mac Pro, iPads, iPods and iPhones EX-DEMO Clearance! Ex-Demo Clearance is available exclusively at Mac City Klang Parade only. This one-day special clearance is in conjunction with Klang Parade Grand Opening! Limited stocks available and while stocks last.